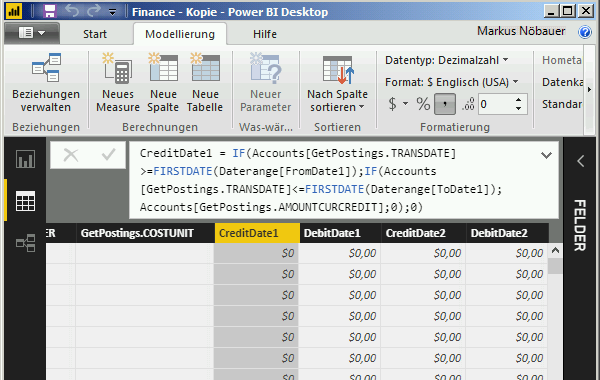 First, we loaded the report data from Dynamics AX into PowerBI. 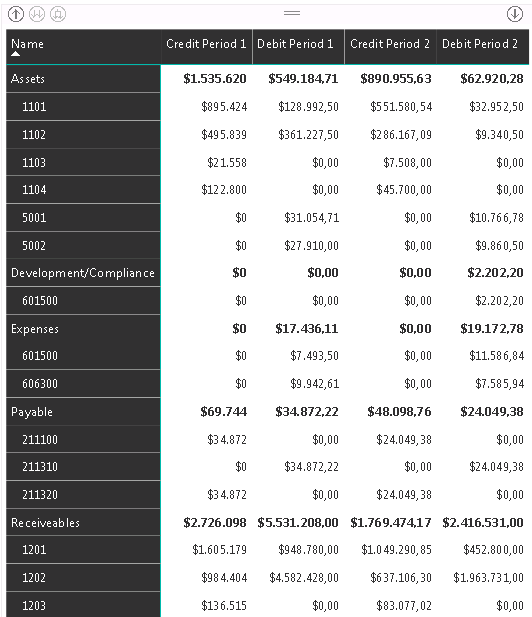 The data contained the LedgerJournalTrans joined with the LedgerAccountView. The Dimenions were renamed to Department, CostCenter and CostUnit. Like initially described the Accounts sheet defines the grouping of postings regarding their account number. For example in line 2 and 3 postings on accounts 1101 .. 1104 and 5001 .. 5002 shall be grouped as “Assets”. Postings on accounts 601500 .. 606300 with a cost center where the 2nd character is 6 shall be grouped separately as “Development/Compliance” regardless if they are also part of the group “Expenses”. Both Excel worksheets were loaded into PowerBI. The Accounts was modifed to replace an empty value in the Costcenter column with the text “%”. This was done to use the Costcenter value in a SQL statement with a Like clause (see section “Calling function from the account definition”). 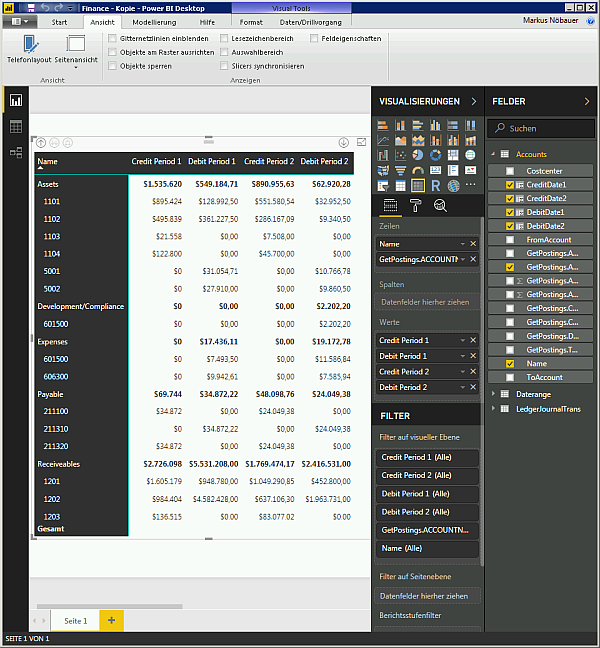 We added 3 parameters to the PowerBI called FromAccountNum, ToAccountNum and CostCenter. The default values are the smallest account number for the FromAccountNum, the largest account number for the ToAccountNum and the text % for the CostCenter. With the parameter in the query and the default values set to the parameters the dataset did not change. Next we added a new function to the LedgerJournalTrans. This can be done from the context menu of the query “Create Function”. PowerBI inspects the query statement and creates function parameter for each parameter in the query. In this case FromAccountNum, ToAccountNum and CostCenter. In PowerBI a function call can be used like a row wise join. A function can be added by using the used defined function button in the query editor. So we added the function call to the Accounts dataset, i.e. each account definition row fetches all postings from the LedgerJournalTrans with the corresponding accounts and costcenter. The query parameter are mapped to the fields in the Accounts table. 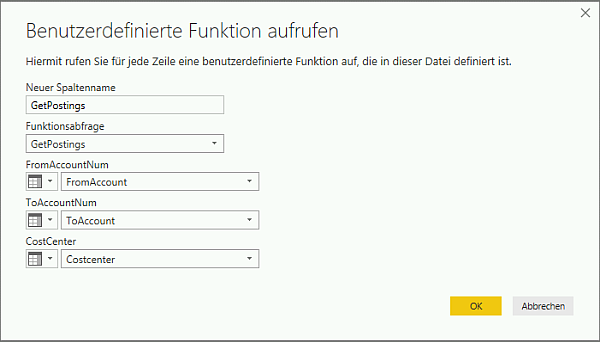 PowerBI will popup a warning that function calls can have a security impact. In the actual version (Mai 2018) PowerBI was quite annoying with security warnings and required a restart (close&open) to stop asking again and again. Finally, expand the Accounts table and the function call results by clicking on the Arrow Right-Left Button next to “GetPostings”. Per default PowerBI adds the fields from the function call result with the function name prefix e.g. GetPostings.Transdate, GetPostings.AmountCurCredit, etc. To get the amount values for each of the two periods, defined in the Daterange Excel sheet, we added 4 additional columns to the Accounts. A debit and credit column for period 1 and period 2. Finally we used a matrix to display the values from the Accounts dataset and grouped it by Name and Accounts. Injecting range values in a query is not the best way to do this. 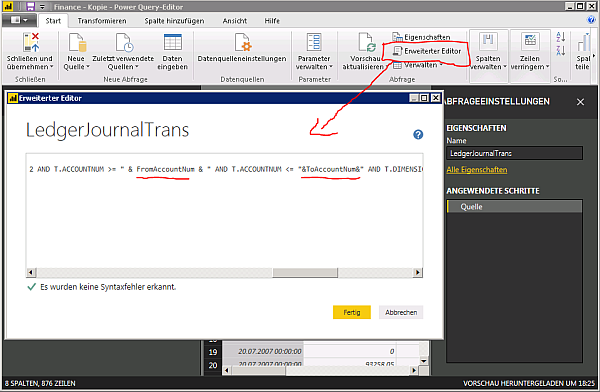 A better way would be to refactor the LedgerJournalTrans query into a stored procedure and provide the FromAccountNum, ToAccountNum and Costcenter as parameter to the SP.